Africa’s trade with the developed world: Reflecting on trade preference schemes (Part III) – Agreements should insist on manufactures trade parity no matter how punitive. As highlighted in Part II, Sub-Saharan Africa (SSA) manufactures’ exports on the back of the European Union’s (EU) Economic Partnership Agreements (EPAs) vary by region. Manufactures accounted for just 3.7% of 2013 EU imports from the Economic Community of West African States (ECOWAS) region in 2013, the lowest amongst the seven African, Caribbean and Pacific (ACP) regions. Bear in mind, West Africa accounts for the largest regional population grouping in SSA. For the Eastern and Southern Africa (ESA) and Southern African Development Community (SADC) EU ACP regions, manufactures constituted at least 30% of total 2013 exports to the EU. The SADC region has always had (and still has) a relatively stronger industrial base. Thus, the EPAs could not be entirely attributed. There are unique local factors. But even at just above a quarter of exports, it is sub-par. Especially, when you compare the other side of the trade. In comparing trade balances, analysts typically subtract total imports from exports, with net exports considered positive and net imports, an imbalance to the downside. Such an analysis would mask how staggering the trade imbalance between SSA and Europe really is. A much more revealing assessment would be to compare manufactures exported by both sides in relative terms. When you do that, the lopsidedness of the schemes become writ large. 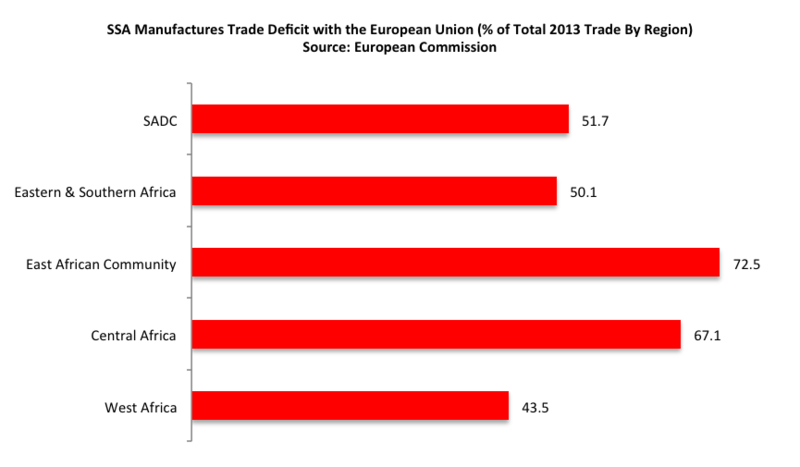 Take the SADC region for instance; European manufactures exports constituted 84% of the region’s imports in 2013. The SADC region is supposed to be a relative success, remember. The table below sets out the imbalances in greater detail. There are all in the red! The only way I think these schemes can force African industrial development is for the agreements to insist on manufactures trade parity; with the European Union as enforcer (as a demonstration of its genuine goodwill and desire to see Africa develop!). That is counterintuitive, of course. Because you’d think African countries would see the benefit of ensuring such parity of their own volition. As they are likely to succumb to consequent currency pressures that the short- to medium-term reduction in exports such a policy would bring about (Kenyan exporters are currently being beat on the back of the delayed signing of the EU-EAC EPA by a cautious Tanzania), they’d need help. Additionally, administrations with tenuous credibility or power (though elected) cannot afford inflation pressures and hot money outflows that such a policy would engender over a time horizon that essentially encompass their elected tenures. Thus, it goes back to my earlier advocacy for much longer tenured administrations both for cost-effective and developmental reasons. A single 10-year tenure allows a President to plan and implement a legacy that is more likely to be lasting on the upside both for the citizenry and his or her own peace of mind during and after office. While I am not privy to the fine print of the new EPAs, the highlights made public from documents on the European Commission website – though an improvement to earlier ones – are not game-changers for African manufacturing, in my view. Indeed, not all African countries have bowed to pressure. As earlier mentioned, Tanzania has asked for more time to review the EU-EAC EPA. There are likely to be more African countries in the future that would want a re-negotiated trade relationship with the developed world. I say here that they should insist on manufactures trade parity whatever the costs! Opinions are mine and not that of any institution(s) I may be affiliated with. This entry was posted in Tweets on October 19, 2014 by rafiqraji.